I have a great love for chocolate. And in recent years since we've learned that dark chocolate (70% and above) is actually good for you, it’s made enjoying chocolate even easier. But how much do we actually know about chocolate and where it comes from? Before my trip, I generally tried to buy higher quality dark chocolate from France or Switzerland (looking at the ingredients closely to ensure that chocolate was the primary ingredient before sugar and other fats. At times I might also purchase the chocolate that said it came from a specific country Madagascar, Equador, etc., (although rarely did I notice a difference in taste). I never gave much thought to how chocolate was made or where it came from. And even though Central America is a small exporter and producer of cacao on a global scale - on my travels I had many opportunities to see cacao as a fruit, how it was processed, and then various different ways to use and consume it. Here is a compilation of photos from Cuba and Guatemala. Depending on the variety, cacao fruits can come in various colours. The green fruit in the top photo is not yet ripe, while both the yellow and purple fruits are ready to be picked. Each cacao fruit contains approximately forty to fifty cacao seeds that are surrounded by a sweet and tart white pulp. The nib within the seed...is where your chocolate comes from! This cacao above is from Baracoa, Cuba's chocolate meca. On a good day, you will pass the chocolate factory and even from inside of an air-conditioned bus, you can smell chocolate being made. The nib itself is 100% pure cacao is quite bitter. When being processed to make chocolate, the pulp is left on, and left to dry. Guatemala was the first time I saw cacao nibs for sale. Above are dry nibs that I purchased from the Minerva market in Xela. They costed less than 20Q a pound (about $2.25 Canadian). In order to use the nibs for consumption, they must be de-shelled. At the house, we simply toasted them in a pan or kamal (tortilla reheater) until they 'popped' - be careful not to burn your cacao! After peeling off the shells, the cacao is ready for consumption! The pure nibs can be used themselves, and if broken down into small pieces, they remain bitter and crunchy, tasting like a mix between a coffee bean and dark chocolate. They are great in smoothies, cookies, and cakes. 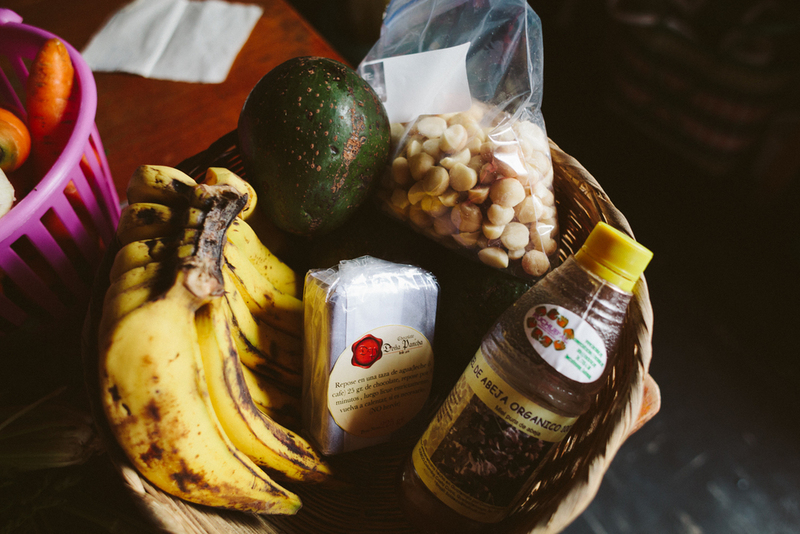 Above are the ingredients that I used to make a raw chocolate avocado banana cake, using pure dark chocolate from Doña Pancha, a well-known specialty chocolate maker in Xela. Doña Panchas is a family business that has been around for seven generations of Doñas. They have the best choco-frutas in the city, and also do a chocolate tasting for 35Q (less than $5 CDN). Unfortunately, I never managed to take a picture of the final cake, it disappeared rather quickly. A word to the wise, be careful not to eat too much cacao late at night. I had a few sleepless nights in Guatemala, following a cacao high from Toma's chocolate cake.